Potato salad doesn’t remind me of picnics, or BBQs, it reminds me of pool parties. Perhaps this is an artifact of my suburban New England upbringing, but a backyard pool party was a much more common summer occurrence than a real BBQ (you know, the kind with smoked pig that I came to love in North Carolina) or a picnic. If we did go on a picnic, it was at the beach, and we were eating tortellini pesto and cold grapes, not potato salad. But pool parties – whether they were at a neighbor’s or a friend’s or even some random friend’s of your parents house – were the peak of a suburban summer. Do you remember how exciting it used to be to get invited to a pool party? The lure of being able to immerse yourself in coolness on a hot day. The feeling of rough concrete under your feet as you tried so hard to “WALK don’t run.” The pleasant chlorine-scented exhaustion of a day spent swimming and running and screaming with your friends. Then, after splashing and fighting over the floaties, you could sit on a lounge chair, the ends of your hair dripping on your legs, and eat pool party food. Hot dogs in squishy buns. Bags of sea salt and vinegar potato chips. Ruby colored fruit punch in the squeeze packs your mother wouldn’t let you buy. Dirt cake. And potato salad. 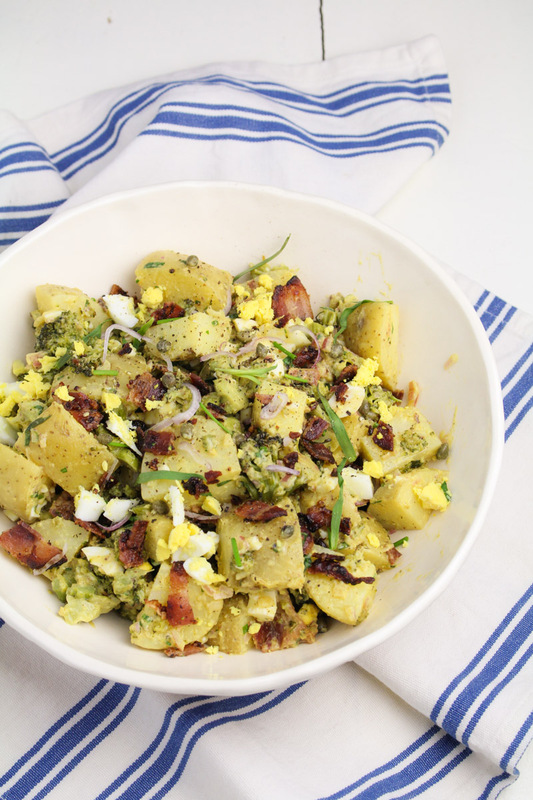 This potato salad is not the gloppy mayo-covered salad of my pool party days. 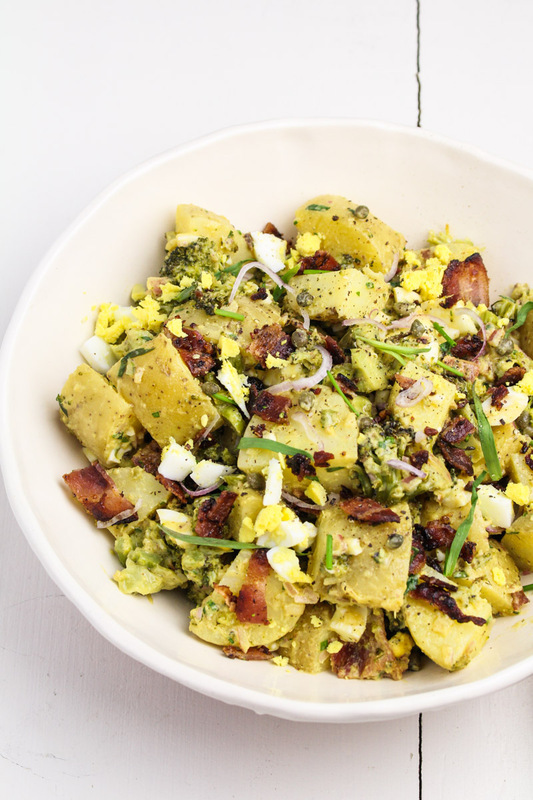 I certainly don’t turn up my nose at a classic potato salad, but at home, I’m making this version. It’s inspired by two separate, but similar recipes. First, a Broccoli and Potato Gribiche I made ages ago, originally from Heidi’s Super Natural Every Day. Second, Bon Appetit’s Eggy Potato Salad with Pickles. 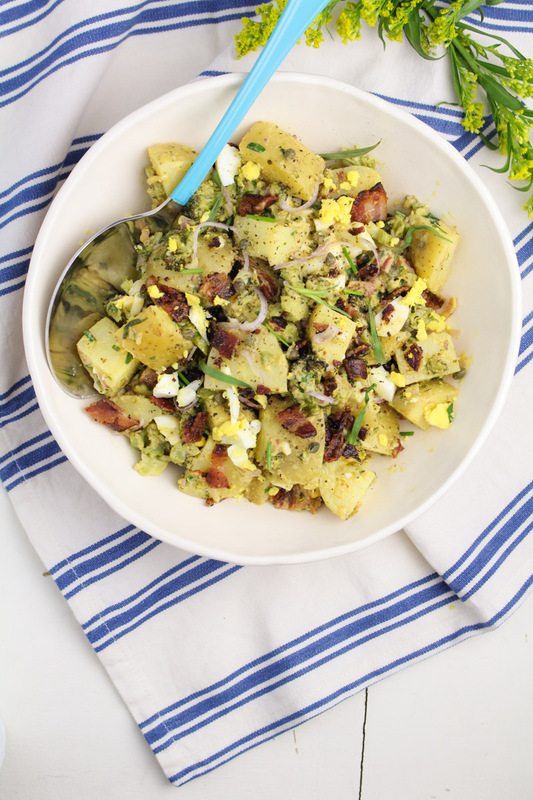 Same general concept – a lighter, brighter potato salad with lots of hard-boiled egg and pickled things to give it zip. I love both mustard and capers, so having them both on top of my favorite vegetable is a win. A large amount of roasted broccoli makes me feel a little bit better about how much of this I can eat in one sitting. Of course then there’s the crispy crumbled bacon, which makes me feel a little worse. 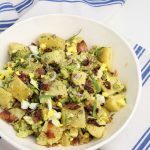 Not your average potato salad, this one is packed with zippy flavor from the mustard, caper and shallot dressing. It takes its cues from French gribiche sauce, but then gets all American with bacon and broccoli and hard-boiled egg. Inspired by Super Natural Every Day. Preheat the oven to 400 degrees F. Toss the broccoli florets with 1 TBS of the olive oil and a bit of sea salt. Spread out in a single layer on a rimmed baking sheet and roast in the oven until tender and browned, about 20-25 minutes. Use a spatula to flip the broccoli once during cooking. Remove from the oven and set aside. Place the cubed potatoes into a large pot and cover with cold water. Salt the water generously. Bring to a boil over medium heat and cook until the potatoes are just tender when poked with a fork but not falling apart, about 10-15 minutes after the water comes to a boil. When the potatoes are done, drain and set aside. Cook the bacon using your preferred method until it is golden brown all over. Drain off the fat into a tin can and place the cooked bacon on a paper-towel lined plate to absorb the excess grease. Once bacon is cool, chop into small pieces. Peel the hard boiled eggs and roughly chop. Place the chopped egg in a large mixing bowl and add the capers, mustard, minced shallot, white wine vinegar, and chopped herbs to the bowl. Slowly add the remaining 3 TBS of olive oil to the bowl, whisking vigorously to incorporate after every teaspoon-sized addition. Using this technique you should emulsify the oil with the eggs, building up a thick dressing with the consistency of a loose mayo or aioli. Once all of the oil is incorporated you will have a creamy sauce. Season to taste with black pepper. 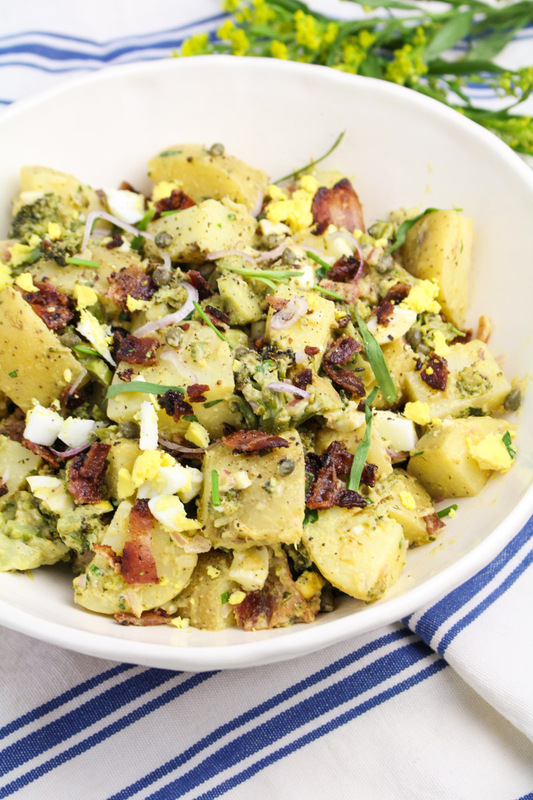 Add the cooked potatoes, roasted broccoli, and chopped bacon to the bowl with the dressing and stir to thoroughly coat the potatoes in the dressing. Serve immediately or refrigerate until ready to serve.